"Without being conscious of it, the working class had conquered power in November of 1918. It had gone in its actions far beyond its explicit demands ‑‑ and far beyond the consciousness it had of its own activity and desires. Now it had to decide whether to consolidate its new‑found power (i.e., create a genuine council system) or revert back to the realization of its initial demands (i.e., peace, food, and parliamentary democracy)." When Germany entered World War I in 1914 internal dissent was minimal. The vast majority of the population regardless of class or party affiliation ‑‑ joined in the war effort. However, as the war progressed, particularly in its final year, dissatisfaction with not only the war itself but also the German political system and, to a lesser extent, the socio‑economic structure, increased. This dis­satisfaction appeared primarily among sailors and soldiers (especially those who wore not engaged in immediate combat on a daily basis) and workers. For neither group was the conduct of the war the sole cause of their discontent. Steadily deteriorating economic and social conditions contributed, indeed in many instances precipitated, their rebellions in the last year of the war. Concomitant with the continuation of the war came a progressive deterioration of living standards for the vast majority of the population, both civilian and military. Prior to the war, the German workers had enjoyed a fairly steady improvement in wages and overall living condi­tions. Germany had been dependent on imports for fully one‑third of its food supply before 1914. As these necessities became increasingly scarce, prices rose, and a galloping inflation developed. The average real wages of the best paid German industrial workers (those employed in the war‑related industries) dropped 21.6% between March 1914 and Septem­ber 1916 while those of all other workers plummeted 42.1% in the same period.
. . . the years 1915‑1916 brought an ever‑increasing economic distress consequent upon the blockade. Foodstuffs became so scarce that governmental control daily came more and more to take the place of ordinary trade. For the majority of the townspeople there began an era of famine of which the symbols were turnips and queues. Notwithstanding the increase in wages, especially in those of the munitions workers, the large majority of wage‑earners was unable to earn enough to eat. The working class was filled with hunger and resentment. The feeling of hatred daily grew stronger for the factory owners, the rich shopkeepers, and businessmen who dealt in army supplies of all kinds, and for officers of the army and navy. The fight for food even made its appearance in the army where, under ordinary conditions, no one regarded it as anything but natural that officers should be better fed than the privates, and should have their better mess. When, however, famine made its appearance and began to affect the rations of the men in the rank angry and envious glances were cast towards the officers' mess. The mass of the population began to realize that those who governed them and set the rations, those who persisted in waging war, and those who managed to avert the suffering caused by the inflation were one and the same. Thus, throughout the period of the war, a clear class polarization took shape in Germany. The trade unions and the Social Democratic Party maintained their support of the government's foreign and domestic policies. Beginning in 1916, workers engaged in direct actions and strikes in increasing frequency in attempts to improve their situation. The dangers in doing so were immense ‑‑ at first, striking workers were drafted into the army; later, they could be forced to return to work under the terms of the "militarization of labor" laws passed by the government. No support was given to the workers by "their" organizations ‑‑ the trade unions and the Social Democratic Party. In fact after 1916, in the face of increasing rebellion, the government turned to these organizations to help control the workers. Despite all these measures discontent and rebellion increased, both among the working class and in the armed services, as living conditions continued to deteriorate and the war continued to drag on. In April 1917 massive strikes spontaneously occurred in Berlin, Leipzig, and other cities. In Berlin, some 200‑300,000 struck in response to a decrease in the bread rations. Despite the dangers involved in their actions and their tradition of following the orders of "their" leaders in the trade unions and the SPD the workers realized that they had no choice but to act for themselves. "The kind of desperation which only a combination of hunger and disillusionment can produce forced the workers of Berlin to shake off the habit of meek obedience and resort to direct action." There, protest against the drafting of Richard Muller, the leader of the radical metal workers shop stewards group, also was involved in the strike. In Leipzig, workers formulated more explicitly political demands ‑‑ peace without annexations, freedom for political prisoners ‑‑ and elected delegates to present their demands to the Chancellor. This was the first embryonic "council" to appear in Germany. The strike ended in two days as the employers promised to cut the work week and raise wages. It was, in truth, the close proximity in which for three years officers and men had lived that in the summer of 1917 made possible a fierce outbreak in the Navy of the class hatred which was at that time sweeping Germany. The officers were socially completely cut off from the men, and powered with illimitable authority. They ate apart from the men, and were better fed than the men; a fact which in itself was a cause of embitterment at a time when famine dominated the thoughts of every man. It is probable that the sailors imagined that the difference between their rations and those of the officers was greater than was actually the case; but the fact remains that the worst form of class warfare ‑‑ the fight for bread ‑­invaded the Navy. At first the Naval High Command sought to appease the rebelling sailors, through meeting many of their demands. The fundamental immediate demand ‑‑ the right of the sailors on each ship to elect "menage commissions" which would negotiate with the officers concerning food and represent the sailors in all other matters ‑‑ was granted. However, this effort at appeasement failed to achieve its goals. Rather than quelling dissent, these committees facilitated and served as the focus for widespread discussions of social conditions on the ships and in Germany as a whole. Through such discussions ‑‑ both formal and informal ‑‑ a sense of class was fostered among the sailors. Hatred of the officers and authority became more explicit and freely expressed ‑‑ both in words and in actions. Some sailors attempted to unionize the navy and affiliate with the USPD (Independent Socialist Party). By mid‑July, Rome 6,000 sailors had committed themselves to this clandestine union. At the beginning of August the High Command became aware of this activity and arrested the eleven men they felt to be the ringleaders. Immediately there were mutinies and sympathy strikes throughout the Wilhelmshaven harbor. By August 4, fully one‑half of the fleet was on strike. The High Command stepped up its tactics of repression. More were arrested and court‑martialed. Two were executed and several others were given lengthy prison terms. The strike was broken. The repression seemed to have succeeded ‑‑ at least on the surface. The sailors were afraid, but they had learned more than fear alone from their experiences that summer. The revolt was temporarily thwarted, but the hatred for those in authority, the sense of solidarity, and the spirit of revolt continued to spread. There were massive demonstrations on the 18 th and 25 th of November, particularly in Berlin, celebrating the announcement of the Russian Revolution (which for the masses meant peace at last) and protesting against the governmental decree banning all assemblies. Soon afterward, the conduct of the peace negotiations at Brest‑Litovsk made it apparent to the German people that despite the intentions of the Bolsheviks, peace was not yet to be realized. "The working class at once gained the impression that the Pan‑Germans were still masters of the situation, and that it was useless to agitate for a peace without annexations or reparations." The nature of the government revealed itself more and more clearly through its unwillingness to yield to the desires of the vast majority of the population. Living conditions took a further turn for the worse. No end to the misery was in sight without a fundamental change in the structure of the government and the society as a whole. Unless the masses ‑‑ workers, sailors, and soldiers ‑‑ were to act for themselves they would have to submit to yet greater slaughter in war and deprivation at home. Hence it appeared to the masses that they must attempt to find for themselves a path to peace and to the democratization of Germany. This feeling formed the background to the great strikes in January 1918 which were a dress rehearsal for the November Revolution. ‑‑On January 14 there were mass strikes and demonstrations in Vienna protesting the failure of the peace talks. Councils were formed which entered into negotiations with the government. Berlin erupted in a mass political strike on January 28. This strike was not spontan­sous in its character. Rather, it had been well‑planned by a group of 1,500 workers' delegates, including representatives from nearly all the munitions factories in the area. Instrumental in this planning was the "Revolutionare Obleute" (revolutionary stop stewards), a militant group of metal workers who fought against the established trade unions as well as the government. Some 400,000 struck on the first day. Factory delegates were elected and a 400‑ member Workmen's Council was formed. "The strikers' main object was peace; they also demanded workers' representation in peace negotiations, better food, the abolition of martial law, and a democratic regime in Germany with equal franchise in Prussia." The strike rapidly spread throughout Germany, reaching Kiel, Hamburg, Leipzig, Brunswick, Cologne, Breslau, Munich, Nuremburg, Marnheim, Madgedeburg, Halle, Bochum, Dortmund, and other towns, with over a million workers going out in the next few days. The Berlin Workmen's Council did not seek to take over the functions of the local or national government, to usurp power, or even to put itself forward as an embryonic organ of dual power. Rather, it was "nothing more than the expression of a mass movement." , the spokesman for the mass desire for peace and a share in the government. The government response was repression and a refusal to negotiate with anyone but trade union and SPD leaders. Some of the workers lost their draft exemptions. The military and the police engaged demonstrators in bloody street battles. Newspapers were censored or shut down. By February 3, most of the strikers gave up and went back to work. Little wits accomplished in an immediate sense by this strike. There were no changes in governmental policy or structure. However, the effect of this experience on the consciousness of those workers who had been involved was considerable. The realization arose that in no way could the masses influence the government to accede to their desires for peace and political reorganization, but, moreover, that the government was willing to severely repress any challenges to its authority. Meanwhile, after the experiences of January, the masses no longer believed in the good will of the Reichstag to extricate them from the war and the military dictatorship. They relied instead on their own power, and hoped for a better opportunity than had been afforded them in January 1918. However, this realization did not lead immediately to further insurrection or overt activity. The awareness of the immensity of the task confronting them ‑‑ especially of the forces upon which the government could rely ‑‑ led to a momentary cessation of direct actions. Repression, political division, deception caused by BrestLitovsk, perhaps also by the reports which began to spread nearly throughout the press about chaos and misery in Russia, military victories which masked the next collapse, all this undoubtedly contributed to plunge the German masses into a sort of apathy until the end of the summer of 1918 . . . . There were sporadic, small‑scale, wildcat strikes in July and August, but they were localized and easily contained and defeated. Thus, some eight months went by with no serious outbreaks of working class activity. Meanwhile, living conditions continued to deteriorate and the war continued, although now the German military was suffering serious defeats. However, the government and the tightly‑controlled press still presented the military situation in a positive light. They went to great lengths to hide the impending military collapse from the civilian population. In mid‑September, the German forces, in an attempt at a last major offensive, suffered such a serious setback that the worsening situation could no longer be kept hidden. Morale at home and at the front sagged. The number of deserters increased. There was a run on the banks and talk of a total collapse spread. In early October there was yet another crushing military defeat. The atmosphere of the entire country seemed to change overnight. There was an effort at reorganization made within the government. Prince Max von Baden became the new chancellor and promises of future democratization were made. This represented no genuine restructuring but only an attempt to quiet dissent. In line with this goal, Prince Max offered cabinet positions to members of the SPD. In late October the German High Command decided to attempt a last gasp naval attack on England in order to cut off its communications with its European allies. Ships in the Wilhelmshaven and Kiel harbors were ordered to put to sea on the 28 th. This surprised the sailors, who had expected immediate peace with the "change" in the government. The conviction spread among the men that the government knew nothing of the proposed naval action; that the officers wanted to bombard the English coast and thus destroy all chances of peace negotiations; and that the whole thing was a coup‑d'etat planned by the Pan‑German officers. Mutinies broke out on several ships. After two days of a tense stand‑off, the orders were withdrawn. The sailors felt that they had won a moral victory. Their celebration did not last long, however. The Admiralty immediately arrested over 600 men who had been involved in the mutinies on board the "Thuringen" and the "Helgoland." They were taken ashore and locked up. The sailors' memories of the executions and lengthy jail sentences of the previous summer were still fresh. The realization that their comrades could not be deserted took hold. The streets in Kiel were filled with sailors, workers, women, and children on Saturday, November 2. "There was a sort of holiday spirit in the air." The next day, over 20,000 sailors turned out for a demonstration in Kiel. There they mingled with the radical dock workers and other local workers. A battle broke out with troops loyal to their officers and eight sailors were killed. The logic of the rebellion led the sailors to the conclusion that they must overthrow the regime or they would be killed. Fearing that there would be further death sentences, the sailors decided to take matters into their own hands. On November 4, mutinous sailors took possession of the town of Kiel. They elected sailors' councils, and the workmen in the shipyards who went on strike elected workers' councils. The workers' and sailors' councils had all the power in their hands. By November 7 the crews of the whole fleet with the exception of some 30 submarines and a few torpedo boats had joined the mutineers. Committees and councils were formed on the ships and in the barracks, as well as for the area as a whole. Troops were sent to put down the insurrection but they allowed themselves to be disarmed by the rebels. Many sailors left the port areas to spread the news throughout Germany and encourage sailors, soldiers, and workers to act as they had. They realized that there was no turning back, that their alternatives were now revolution or death. The government sent Gustav Noske (an SPD bureaucrat) to Kiel in response to the sailors' demands to meet with representatives of the opposition parties ‑‑ the USPD (Independents) and the SPD. Noske delivered an impassioned speech and was elected governor of Kiel by the Sailors' and Workers' Council. Thus, the naval rebellion was recuperated by the SPD. However, the ideas and spirit of the rebellion had already spread. Councils sprang up in Cuxhaven, Bremen, and Hamburg on November 6. The German regime was about to collapse. Prince Max summoned Ebert the SPD minister, and turned over the chancellorship to him. Ebert was committed to saving the monarchy. But it was clearly a case of too little, too late, on the part of the government. ‑‑In the next few days, all of Germany erupted in a spontaneous uprising, taking all the political leaders (from far right to far left) by surprise. Mass demonstrations against the war and the deteriorating living conditions appeared throughout the country. The sailors' appeals had struck a responsive chord. Overnight, the entire nation seemed to come to a standstill. Soldiers refused to suppress the demonstrators and most even went over to their side. The power of the government evaporated. Workers', sailors', and soldiers' councils sprang up and, temporarily, political power was effectively in their hands. The role of the councils ("soviets") in the Russian Revolution had certainly helped propagate the idea of their organizational form. However, far more important was the experience of the German working class and armed service personnel themselves, particularly in the face of their difficulties and their experiences of the last two years. During the first days of the November Revolution, Workers' and Soldiers' Councils were elected in all workshops, mines, docks, and barracks. The people were in motion. Whenever crowds assembled, they nominated spokesmen and elected delegates, who were to speak and act on their behalf as their direct representatives. This happened all over the country. Independent councils, based on factories rather than on trades, as had been common previously, appeared spontaneously all over Germany. This was to a considerable extent a result of the economic chaos. When a factory came to a standstill due to lack of fuel or raw materials, there was no one to turn to for help. Government, parties, unions, capitalists, could do nothing to solve basic problems of transport, fuel, raw materials, etc. Resolutions, declarations, orders, even paper money were of little use. Under the circumstances, workers would form a council and try to solve their problems by themselves. This description, in light of the other available historical and firsthand accounts, seems to be an over‑estimation of the development of self‑management in November 1918. One important feature of the "Rate" system is the direct and permanent control of elector over deputy. The deputy can be deprived of his mandate at a moment's notice if and when he does not exercise it in accordance with the will of his electors. The "Rite" system Is therefore an even more extreme and direct form of democracy than a parliamentary system. The councils were unable, and in most cases unwilling, to maintain their power for long. On December 16, 1918, the conference of Workers' and Soldiers' Councils in Berlin voted to set up elections for a parliamentary National Assembly, effectively divesting themselves of all power. Even though many of the delegates to this conference were not workers themselves ‑­i.e., they were political party leaders, soldiers, even officers, etc., ‑‑ they had been elected and were functioning as the expression of the will of their constituency, although more on the basis of the old Social Democratic movement than on the basis of common social experience. There were no massive demonstrations in protest against this decision when it was announced. Thus, there is no point in speaking of a "betrayal" of the masses. Rather, we must ask how and why the masses, after holding power, were willing to give it up again. Before turning to this difficult question, I would like to present some descriptions and analyses of the development of working‑class activity in different areas in Germany. In this meeting, what one may call the "spirit of revolution" was clearly evident. Elated by the war's end and ebullient with the release of pent‑up emotions, the excited participants filled the hall with cheers and shouts as groups of sailors from Kiel and various escapees from military prisons leaped upon the stage to urge their comrades to action. The Independent leaders, who had called the meeting, did not create this spirit. They could only hope to channel it for the accomplishment of concrete ends, something that the Majority Socialists had so patently failed to do that afternoon. With great difficulty, the USPD leaders were ultimately able to bring the meeting to a vote on a series of specific proposals: workers' and soldiers' councils must be formed; no functionaries of the trade unions or cooperatives should be allowed to participate; the workers of Hamburg should at once go out on a general strike in support of the socialist revolution. These proposals were adopted unanimously. The next day, November 6, the city government recognized the Workers' and Soldiers' Councils as legitimate governments and offered to enter into negotiations with them. In other words, it paid lip service to their "legitimacy" but had no intention of turning over its power to them. Thus, a situation of dual power existed and, for the most part, indecision reigned. Between November 7 and 10, councils were elected according to a specific procedure and a political structure was created.
. . . each plant electing delegates in accordance with an intricate system of proportional representation. These delegates, who together constituted the Workers' Council, were then to come together with the delegates elected by the various military units in the area (the Soldiers' Council) to elect the Executive. The Executive, in turn, would elect from its membership the Presidium, which would then assume the executive powers of the government. Questions of basic policy were to be decided by a joint meeting of the members of the two Councils. The Executive Council consisted of eighteen factory delegates plus three delegates from each of four groups ‑‑ SPD, USPD, "Free Unions," and "left radicals." Laufenberg, from the left wing of the USPD, and an advocate of the council system, was elected head of the Presidium. On November 12, the Presidium voted that the Councils would replace the city government. The council delegates took over City Hall and flew the red flag. This was the peak of the Councils' power. Four days later, under the pressure of growing financial problems and the opposition of wealthy businessmen, the Presidium voted to recreate the local government and Senate as the "administrative organs of the Councils." On the 18th, a group of Hamburg businessmen became the "Economic Advisory Council." Thus, real power returned to where it had been two weeks before, i.e., in the hands of the rich businessmen and bureaucrats. Power on the factory level remained undisturbed as well. In the elections to the local government of January and March of 1919, the SPD received a majority of the votes. Also in March, elections to the new Workers' Council were held. This time, delegates were elected in the same manner as government representatives, rather than on a shop basis as before. This new Council had no clear functions but soon became oriented toward welfare problems. Meanwhile, unemployment (over 10% in January) and economic problems (especially food and coal supplies) began to mount. In the early part of 1919 there were a few big demonstrations and strikes in Hamburg. On February 6, there was a mass demonstration to protest the occupation of Bremen by Berlin troops. Many of the workers were armed, expecting perhaps similar treatment for themselves. Nevertheless, a month later, some 80% of those eligible to vote turned out for the local elections, giving the SPD a majority. On April 15, a demonstration of unemployed got out of hand and stormed the Workers' Council. There was plundering and looting amidst widespread rioting. Around half of the local troops and police went over to the demonstrators. The government finally managed to restore order by use of force. The role of the SPD had become clear at last to the working people of Hamburg. The SPD sought to purge the police and the troops, creating a loyal elite army corps. In May, the publication of the draft of the Works Councils Law (which gave the councils only token rights to co‑determination and would have subordinated them to the trade unions) aroused protests and demon­ strations In Hamburg. The reaction in Hamburg to the new law was immediate and violent. Several works councils got together at once and sent telegrams to Berlin demanding that the law be changed. Then they proceeded to organize a Committee of Nine to unify the existing councils in opposition to the law. On May 30, representatives from all the Hamburg works councils met and declared their opposition to the draft; . . . This Committee of Nine became the focus for opposition to the Councils Law, the trade unions, the SPD, and the Reich government. However, these forces came to work closer together against the desires and activities of the workers. Thus, the unions began to expel workers who opposed their policies ‑‑ or those of the government. Any worker who was thrown out of the union then was fired from his job by his employer. "The threat of losing one's job in Hamburg, at a time when unemployment figures continued to mount, was a serious one." Most workers chose to suppress their dissatisfaction rather than chance starving. But on June 24 a mass demonstration protesting the quality of the meat rations led to a battle between the crowd and the new troops. The Committee of Nine expanded to a Committee of Twelve and became the organized expression of mass discontent and a threat to the established power. A state of virtual civil war existed. The next day the troops were taken by surprise, disarmed, and marched through town. On the 27th, Noske announced in Berlin the sending of troops to protect the Hamburg government. A state of martial law was declared. However, the troops, inexperienced and few in number, were beaten and driven back to Berlin. Then a large detachment was sent and the local forces were defeated. Hamburg was occupied and under martial law until December. Moreover, the SPD‑controlled Workers' Council for the city sought to bring the then autonomous Committee of Twelve under its control. The Committee was officially declared an organ of the Council. Further manipulations by the SPD and right‑wing members of the USPD spelled the end of this expression of working class autonomy. An uneasy peace reigned for a few months. The abortive Kapp Putsch in March 1920 was greeted by a general strike in Hamburg ‑‑ as in the rest of Germany. Workers armed themselves and struck against the attempted rightist coup. However, they failed to consolidate their gains after the strike, virtually divesting themselves of real power for the second time in less than a year and a half. One of the major causes of this failure ‑‑ and the then apparent decline of the Hamburg labour movement ‑‑ was the existence of sharp divisions within the working class. Disputes between workers belonging to different parties undermined the class solidarity which might have grown out of the united strike action. 1921‑1923 were years of further turmoil in Hamburg. There were mass demonstrations and strikes, occurring for various reasons. However, existing organizations, from the KPD (Communist Party) to the SPD and the conservative trade unions, were able to encapsulate the movements, take over their direction, and lead them back in a non‑revolutionary direction. At times, the KPD seemed willing to spearhead a mass insurrection, but under orders from Moscow, they usually backed down. The activities of the various parties should not be viewed as "betrayals" of the working class. A combination of internecine fighting, severe repression, the threat of unemployment, and subtle cooptation, along with a resilient faith in the institutions of bourgeois democracy, managed to confine and demoralize the working class in its futile efforts to assert its autonomy and manage production and society as a whole. At first ‑­i.e., in 1918 ‑‑ there were strong illusions about parliamentary democracy, the SPD, and the trade unions, illusions which were at the time rampant throughout Germany. The "propaganda of real events" dispelled these illusions among most of the workers. By then, however, it was too late. The Berlin regime had fortified itself, there was a new army, well‑equipped and loyal to the government, and the unions now had the power to force adherence to their policies. The Hamburg developments in many ways parallel those of the rest of Germany in the same period. ‑‑The situation in Bavaria was much more complicated. On November 8 a "Council Republic" was proclaimed from above by Kurt Eisner of the USPD who formed a "socialist" cabinet which was composed of party representatives, not factory delegates. Not only did the new government come into existence prior to the formation of councils at the local and factory levels, but it made no effort to depose the already existing state bureaucracy. Eisner and his Council Government found itself ill‑prepared and isolated: lacking administrative experience, it relied on the existing bureaucracy; in the absence of a firm base among the population, it was forced to collaborate with the Majority Socialists and peasant organizations at the price of postponing the social revolution until an indefinite future time. This is not to imply, however, that there was an absence of working class activity in Bavaria. It took various forms in different places due to existing specific local conditions. The government encouraged the formation of councils, although in a vague manner. Revolutionary councils were formed in every major city of Bavaria within days after the coup‑d'etat of November 7 . . . . The form and importance of the councils . . . differed from city to city: in Augsburg a council of workers and soldiers seized complete authority; in Nuremburg a strong council was compelled to tolerate a strong mayor; and in heavily Catholic Regensburg the mayor was able to maintain his prerogatives and to dominate the local councils. It is possible to record with assurance that, by the end of November, there was some sort of council organization in virtually every township in Bavaria; one may therefore presume the existence of at least six to seven thousand separate bodies in the entire council system. These councils were composed in every conceivable manner and represented a wide spectrum of political persuasion. With a few exceptions the councils had little influence or contact outside of their separate localities, and for that reason the term "council system" may be somewhat misleading. For the most part the local councils had similar relationships to the local civil service bureaucracies as the Bavarian "Council Government" did. It was characteristic of the workers' councils either to force out local officials entirely or (more often) to effect administrative modus vivendi with governmental bureaucrats. With its seat in a town hall or district office, a workers' council would normally seek to dictate or oversee bureaucratic functions. In Munich a city‑wide council was immediately formed. It then supervised elections to shop councils which then formed a reconstituted city‑wide council from below. However, these councils exercised little power, being under the administrative control of Erhard Auer, the Minister of the Interior and an opponent of the council system. 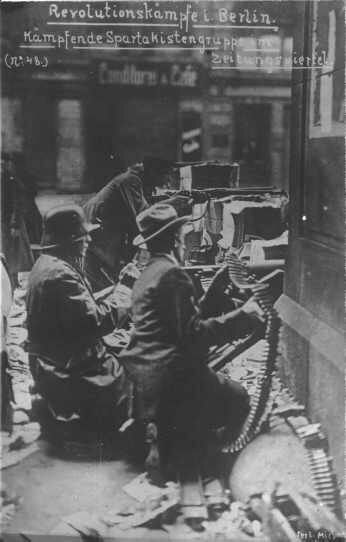 In May 1919 a mass rebellion in Munich, protesting against ever‑deteriorating living conditions and the sham "council government," was put down by Berlin troops who then established martial law. In the army, councils were also rapidly formed. However, they remained under the control of the leaders of the military, effecting little real change. The soldiers' councils rapidly assumed a form similar to the cadres of the existing military establishment. For each unit of the Bavarian Army a representative council body was established as a counterpart. The first element, constituted during the night of the rebellion in Munich, had been a sort of extemporaneous general staff, designated simply as the Council of Soldiers. From this central authority originated, on November 8, instructions that each military post was to select a barrack council of ten soldiers . . . . When a measure of order had been restored in the city, further regulations were issued in an attempt to establish the rudiments of a council system for all of Bavaria. Instructions on November 13 specified, 1) that besides the barrack councils, there were to be councils in the military hospitals to represent the wounded; 2) that trustees were to be elected to councils at the division level; 3) that all soldiers' councils "were to find their culmination in a Steering Committee;" 4) and that the Steering Committee, in turn, would delegate two plenipotentiaries who would "work together in the most intimate contact" with the Minister for Military Affairs . . . . The functions allotted to the soldiers' councils were sufficiently vague to offer the councils a hope of grandeur and yet to withhold any real authority. The barrack councils were granted the right to hear complaints, recommend promotions, request the removal of junior grade officers, and to "assist" in army command posts. But the last word in every case was accorded to the Ministry for Military Affairs, where the presence (without prescribed powers) of the council plenipotentiaries might or might not be of substantial importance. 3) effectively reduced the workers' councils to an adjunct of the bureaucracy While assigning to them only perfunctory bureaucratic duties. All executive power was centralized in the state government and remained out of the reach of the mass of the population. There was little protest about this action. Moreover, there had been little activity as regards demands for the self‑management of production or the society as a whole. Bavaria, primarily a peasant area, is a prime example of the rapid appearance of councils which had hardly any revolutionary content at all. In 1919, Bavaria became the scene of several coups and attempted coups, both by the right and by the left. However, precious little of all this governmental turmoil touched the daily lives of the working people and peasants, who were relatively complacent throughout 1919 in comparison to the rest of the country. The Bavarian "Council Republic" passed away quickly, as did its effects on the consciousness of the inhabitants of this area. ‑‑‑The situation in Berlin was extremely complicated because it was the focal point, indeed the seat of power, the trendsetter for the rest of Germany. Thus, considerations of the national situation played a role from the start in the situation in Berlin, as the local Executive of the Workers' and Soldiers' Councils claimed to be the legi­timate national government. Developments in the national situation, as they reflect and condition working class activity in Berlin, are focused on in this section of the chapter. As was stated earlier, the Imperial Government collapsed November 9, 1918, In the face of a spontaneous uprising by soldiers, sailors, and working people. Immediately a situation of dual power existed, in Germany as a whole and in many specific cities and areas. In Berlin two national executive bodies existed simultaneously, with an unclear line of demarcation between them. There were the People's Commissars (three from the SPD and three from the USPD) who were the Provisional Government, and the Executive Council of the Berlin Workers' and Soldiers' Councils. Theoretically, the Executive Committee was the real power and the People's Commissars were to be subordinate to them. In reality, this was not the case. The People's Commissars, representing for the most part the old German political and social institutions, were able to maintain a great deal of power. They ran after the revolution, caught it, tried to contain it, and lacking the power to totally take control of it, tried at least to orient it, to keep it from questioning the state structures that it shouldn't shake and disturb the foundations of the Reich. Faced with the danger [ i.e., losing control ] the Union leaders decided not to fight the Workers' and Soldiers' Councils outright (this policy would have been too unpopular), but to reduce them to shop stewards committees with strictly limited functions. The idea was that the shop stewards committees should closely cooperate with and be guided and controlled by the unions. The fundamental issue was whether Germany would become a "Council Republic" or a parliamentary democracy ruled by a National Assembly. The secondary, but connected, issue what that of socialization ‑‑ who would control production. The SPD and the unions supported the creation of a National Assembly and sought to strip both the political councils and the factory committees and councils of all their power. However, no policies could be forced on the masses, i.e., the SPD and its cohorts at the time lacked control over the means of coercion. Thus, it was necessary to win the masses over to their side. Despite the apparently radical nature of the November uprising, this was rather easily done. In the first place, the working class had become accustomed to certain traditions and beliefs which in many ways corresponded to their real pre‑war situation. Indeed, until the war, the living conditions of the German working people were steadily improving. The workers had learned to entrust their fate to "their" SPD and trade union leaders. During the war, all this broke down. As we saw earlier in this chapter, the workers began to act for themselves out of necessity toward the end of the war. However, the SPD and the unions put themselves forward as the embodiment and the organizations of this initially autonomous movement. Without being conscious of it, the working class had conquered power in November of 1918. It had gone in its actions far beyond its explicit demands ‑‑ and far beyond the consciousness it had of its own activity and desires. Now it had to decide whether to consolidate its new‑found power (i.e., create a genuine council system) or revert back to the realization of its initial demands (i.e., peace, food, and parliamentary democracy). The SPD played on this deeply‑felt belief in democracy to argue that a council system would be a dictatorship rather than a true democracy. This struck a responsive chord among the workers in November , and they approached even their own organizations ‑‑ the councils ‑‑ in a manner like that of parliamentary democracy electing delegates by parties rather than natural constituencies, such as the common social experience of working on the shop floor. Few workers were capable of refuting this argument which corresponded with their own ingrained beliefs. Despite what they had achieved, they still believed in traditional forms of organization. Thus they allowed the representatives of the social‑democratic movement, the unions, the left socialdemocrats, the consumers' cooperatives, etc., all to be represented on the councils as well as the factory delegates. The councils on such a basis could no longer be directly representative of the workers on the shop floor. They became mere units of the old workers' movement, and thus came to work for the restoration of capitalism by means of the building of democratic state capitalism through the SPD. Thus, in a very short time, the working class shared out ‑‑ if not gave away ‑­the power that had fallen to it. By December 16, 1918, the date of the first conference of the Workers' and Soldiers' Councils, power remained in name only in the hands of the councils. Thus, their decision to commit suicide, to yield their "power" to a National Assembly, was merely the legitimation of a process that had already begun and was preceding full speed ahead. Without being conscious of it, the working class had conquered power in November of 1918. It had gone in its actions far beyond its explicit demands ‑‑ and far beyond the consciousness it had of its own activity and desires. Now it had to decide whether to consolidate its new‑found power (i.e., create a genuine council system) or revert back to the realization of its initial demands (i.e., peace, food, and parliamentary democracy). 1. Germany is a unified socialist republic. 2. Complete power to the workers' and soldiers' councils. 3. The Executive Committee, elected by the Central Council, as the highest organ of legislative and executive power by which even the People's Commissars and all central authorities of the Reich are to be appointed and removed. 4. Abolition of Ebert's Council of People's Commissars. 5. Immediate and energetic execution by the Central Council of all measures necessary for the protection of the Revolution; above all, the disarming of the counter‑revolutionaries, the arming of the proletariat, and the forming of a Red Guard. 6. Immediate proclamation by the Central Council to the proletarians of all lands for forming workers' and soldiers' councils in order to carry through the common task of the socialist world revolution. Despite these demands, the conference overwhelmingly voted in favor of the election of a National Assembly and the giving up of power by councils throughout Germany. The mass response to this decision was not at all rebellious. At this time ‑‑ the end of 1918 ‑‑ the working class seemed to be satisfied with the achievement of peace and parliamentary democracy and believed that now the economic problems would somehow be solved within the present structure of the German economy. Such attitudes did not last long, however, giving way in the face of the reality of the situation the workers faced over the next few years. ‑‑In the five years after the November Revolution, the German working class continued to struggle against the government and the institutions which developed after the revolution. New conceptions developed among many workers in the face of the necessities of the moment and the rising expectations caused by the revolution. The economic and social crisis continued unabated after the war ended. Indeed, Germany went from crisis to crisis ‑­economically and socially ‑‑ for several years. At the beginning of 1919, the working class expected to see a concrete improvement in living standards and working conditions. Nothing of the sort was forthcoming. After the victory of the Revolution, the workers wanted to see new paths opening before them, they wanted to take an active part in the reconstruction of industry. The strikes were an expression of their desire to achieve new economic and social conditions. Instead, they were asked to continue working for their old employers with empty stomachs and leaky boots. In early January of 1919 there were massive street demonstrations in Berlin, organized by the Revolutionare Obleute and the Spartacists, protesting the removal of Emil Eichorn as police commissioner for the city. Eichorn was the last member of the USPD still holding an important public office. The organizers of the demonstration had hopes that they could mobilize masses of people for an attack on the new bastions of power. Some 700,000 people took to the streets on January 5 in response to the leftist calls for action. However, there was little direction to the demonstrations. Some groups tried to begin street battles with the now forces of order, but they were militarily defeated without much difficulty by the 11th. Precious few of those who turned out for the demonstrations became engaged in the fighting. For the most part, there was a situation of a large, fairly peaceful demonstration, while, at the same time, small groups engaged in guerrilla activity. A few days later, the 16th, 30,000 of the 35,000 eligible voters cast ballots in the elections to the National Assembly. Obviously, the vast majority of the population was still willing to try its luck with the institutions of bourgeois democracy. With the elections to the Assembly, all the political councils throughout the country lost their legitimacy and their claims to power, and most of them disappeared. Throughout the first half of 1919, there were scattered uprisings across Germany. There were different specific causes behind each one, but, in general, one can say that rising expectations combined with deteriorating living standards to create a very volatile situation. Moreover, all this time, the workers were learning from experience what sort of activities might be successful and what sort were bound to be fruitless. The German working class was progressing from their understanding of themselves as a class to an understanding of what the tasks of a working class in a crisis situation should be, i.e., slowly, revolutionary class consciousness was developing. It was necessary throughout this period for the government to send troops to quell dis­orders in Bremen, Hamburg, Leipzig, Halle, the central German mining districts, Brunswick, Thuringia, and the Ruhr. If the government had not been able to assemble its elite corps of loyal troops, it is doubt­ful if the working people in these areas could have been stopped in their efforts to create their own social organization and structures. Revolts not only occurred at great distances from the seat of the new government. In March of 1919 there was yet another general strike in Berlin, in which the preponderance of activists were sailors. The new troops suppressed the rebellion and held mass executions. The govern­ment was becoming much more serious in its repression and the working class gave indications of becoming yet more serious in its actions. In May, the elite troops occupied Munich and executed hundreds of workers. The continuation and intensification of the strike movement with its political demands and use of force despite the convening of the National Assembly testifies to the strength of revolutionary feeling in Germany, which also explains the growth of political radicalism in the year leading up to the Kapp Putsch. Behind the political grievances were genuine economic hardshipsi prices had risen more than wages, food was scarce and expensive. In the year 1919 there were nearly 5,000 strikes, with a loss of 48, 000,000 work‑days. The 1920 figures were to be even higher. On January 13, 1920, a peaceful mass demonstration in front of the Reichstag in Berlin protesting the content of the new Works Council Law being discussed inside was fired upon by government troops. Forty‑two workers were killed. This further alienated the workers from the government itself as well as the SPD and brought about an awareness of the weakness of peaceful demonstrations. In February, massive demonstrations swept Germany in the face of the passage of the Works Council Law itself, which was seen by those involved as a sham and an attempt to totally subjugate the workers to the trade unions and destroy any remnants of self‑management. However, on March 20, a new situation presented itself. A group of rabid rightists, including a large part of the elite army the SPD had fostered, under the direction of Kapp, a right‑wing industrialist, sought to overthrow the government. The economic chaos was becoming intolerable to the rich capitalists as well as to the workers. Naturally, the solution sought by the capitalists and the militarists was considerably different from that of the working class. This attempted coup was greeted with the biggest general strike in German history. Although this strike was a high point in working class activity, it took the form of a defense of the government against against the right. Over 12,000,000 engaged in this battle against the "Kapp Putsch." Once again as in November of 1918, effective power was in the hands of the working class. Once again, the working class had exceeded their intentions ‑­and their consciousness and understanding of their activity ‑­in their actions, and, once again, they chose to reaffirm their initial intentions, i.e., protecting the government, rather than consolidating their autonomous power. Certainly, in some areas and among groups of workers in other areas, the realization took hold that the workers could run society themselves, and indeed must do so if they were to get out of the situation of facing one crisis after another and enduring ever‑deteriorating living conditions. However, this understanding, this attainment of the core of revolutionary class consciousness, did not spread throughout the German working class. Many workers still held on to the old conceptions and traditions which were being undermined ever so slowly by the developments in Germany. The response to the abortive "Kapp Putsch" was the last mass struggle on a national level in Germany until the summer of 1923. Living conditions continued to deteriorate between 1920 and 1923 as the country was gripped by a severe inflation and was further shaken economically by the need to pay reparations to the victors of World War 1. Strikes continued to occur throughout the country. Indeed, each year saw yet more strikes. However, these activities were, to a large extent, local in scope, and the government, having regained control of the means of coercion, suppressed them brutally. In the midst of this chaos and working class activity, some interesting new organizations were formed in 1920 ‑‑‑ the KAPD (a split‑off from the Communist Party which rejected Leninist notions of a party while accepting the need for revolutionary organizations to "educate" the workers); the AAUD (an anarcho‑syndicalist organization which sought to create the structures of the new society In the form of industrial unions and worked more or less as the industrial arm of the KAPD); and the AAUD‑E (a split‑off from the AAUD which objected to working with the KAPD or any organization separated from the mass of workers and developed an ideology quite like the IWW ). Although many new ideas concerning working class autonomy developed ‑growing out of the experiences of workers and radicals since 1918 ‑the government now had sufficient force on hand to destroy any isolated uprisings. This was the case in the Ruhr and in Saxony in 1923. The mass of the German working class was unable to develop means of national coordination and united activity. On August 11, 1923, the German working class engaged in its final mass action. In response to the spiraling Inflation and the deterioration of living conditions, the workers spontaneously rose all over Germany. The government fell ‑that is, those in charge of the government lost power ‑‑ and new faces, again from the SPD, appeared at the top of the political structure. Reforms were promised and repression was implicitly threatened. Once again, the working class failed to carry through the implications of its actions. To all intents and purposes, this was the end of the German working class movement. As Evelyn Anderson argues, the position of the Social Democratic Party on the war must not be construed as a "betrayal" of its constituency. Rather, "they acted as the willing instrument of the masses rather than as their guides." (Hammer or Anvil, p. 25). Anderson, op. cit., pp. 10‑11. Feldman, Army, Industry, and Labor in Germany, 1914‑1918, P‑ 98. Ibid., P. 117. 6 Rosenberg, op. cit., p. 90. Rosenberg, op. cit., P. 154. Halperin, Germany Tried Democracy, p. 26. Badia, Le Spartakisme, p. 124. BAdia, op. cit., p. 126. Cf. also Ryder, The German Revolution of 1918. Schubert and Gibson, Death of a Fleet, 1917‑1919 and Vidil, Les Mutineries de la Marine Allemand, 1917‑1918. Rosenberg, op. cit., P. 183. He adds that the primary political desire of the sailors at this time was "a speedy peace and the creation of a state of things in which officers would no longer wield a dictatorial authority over the nation." Rosenberg, op. cit., p. 206. Moreover, the failure to come to terms concerning the European theater after the reaching of an agreement concerning the Oriental front revealed that the German government still sought to annex the important Belgian industrial areas. Rosenberg pointed out earlier (P. 105) that such a policy was perceived by the working class as an attempt by the industrialists to make greater profits and therefore was met with much anger. "The war had deprived the German people of sufficient quantities of the basic necessities of life. The food problem had arisen early in the war. The coal shortage developed in the winter of 1916‑1917. Now, in the last year of the war, there were serious shortages of clothing and housing as well. The clothing supply had deteriorated sharply because of the shortage of raw materials and the use of inadequate 'substitute' products. Shoes were in particularly short supply. No less serious was the shortage of soap . . . . Many German workers were now being forced to contend with lice. Finally, the flood of workers into war production centers created a housing shortage and a rapid rise of rents." Feldman, op, cit., p. 459. Rosenberg, op. cit., p. 207. Badia, Les Spartakistes, p, 25. Ryder points out that the food situation was particularly bad in Vienna. (OP. cit., P. 115) "Hundreds of thousands of workmen threw down their tools in Vienna, Budapest, and other industrial centers." Rosenberg, op. cit., p. 210. Badia, Le Spartakisme, p. 137. "The Revolutionare Obleute developed out of a small circle of Berlin metal workers. All their members were highly skilled craftsmen and active trade unionists of long standing . . . . The chief aim of the Revolutionare Obleute was to transform the unions from purely industrial into political and revolutionary organizations." Anderson, op. cit., P. 37. Badia, Le Spartakisme, p. 141. Rosenberg, ibid., p. 215. Rosenberg, ibid., p. 213. He adds that it "bore no resemblance whatever to a Soviet." The German workers' yearning for peace, unlike that of his Russian counterpart, was not a yearning for peace at any price. If the German workers had been truly revolutionary, the strike would not have been such a fiasco." Feldman, op. cit., p. 456. Rosenberg, op, cit., p. 217. The solidarity which developed from this experience was expressed in the organizational form of shop stewards committees, closely connected with the Revolutionare Obleute. As leaders (e.g., Richard Muller) were drafted, new ones appeared from within the ranks. Cf. Ryder, op. cit., p. 119. Badia, Le Spartakisme, p. 146. Ryder, op. cit., p. 122. Rosenberg termed this a "change to middle‑class parliamentary democracy without any immediate alteration in the constitution." (Op. cit., p. 247) 1 find it difficult to consider this as more than a change of faces at the top, as the distribution of power was unaffected. Rudin, Armistice 1918, p. 252. Rosenberg, op. cit., p. 266. The USPD representative failed to reach Kiel in time. "By his clever temporizing, Noske entirely forestalled and outwitted the Independents [i.e., USPD] who had been at such pains to prepare the movement . . . . Finding himself powerless, with considerable finesse he feigned sympathy with their [i.e., the sailors'] ideals and thus succeeded in keeping a dangerous movement within bounds." Delmer, "Inner History of the German Revolution," The Nineteenth Century, Vol. 87, March, 1920, P. 559. Rosenberg argues that "the impetus to the German Revolution was given wholly by the soldiers. If the army had been opposed to it, on." working men alone would never have been able to carry out a revolution. A History of the German Republic, p. 4. "During the four years of war the old State had gradually crumbled to ruins. The process was infinitely slow and for the most part invisible, and when the catastrophe came dominion fell to the proletariat, like a ripe fruit into its lap." Stroebel, The German Revolution and After, P. 58. Ryder, op. cit., p. 148. Anderson writes: "The German Arbeiter und Soldenraten (the Workers' and Soldiers' Councils) were a spontaneous creation of the German Revolution, just as the Soviets had been a spontaneous creation of the Russian Revolution. They had not come into existence in response to foreign or sectarian propaganda, but as the natural ad hoc organizations of masses in revolt." OP. cit., P. 43. "Then and Now: A KAPD Veteran Talks to a Young German Revolutionary," Solidarity, Vol. 6, No. 2, n.d., pp. 12‑13. Paul Mattick, also a former KAPD member, was at that time working in a large factory in Berlin. In relating his experiences to me, he minimized the extent of the sort of activity that Reichenbach describes. However, where such councils formed (e.g., among miners in the Ruhr), their development did follow the process depicted by Reichenbach. Anderson, op. cit., p. 44. Unfortunately, my inability to read German has severely limited the areas I can examine with any thoroughness. In particular, probably the most serious attempt at self‑management took place among the Ruhr miners and in Bremen, but nothing is available in either English or French discussing these areas. Comfort, Revolutionary Hamburg, P. 39. The SPD favored parliamentary democracy over the council system; the USPD wanted both, but sought at that time to postpone all parliamentary elections in order to give the councils time to develop. Comfort, op. cit., p. 46. Comfort argues that this was due to "the lack of trained manpower to take over the administrative machinery." (Ibid., p. 49). Ibid., Chapter 6, "The Decline of the Hamburg Labor Movement," PP. 109‑130. On the role of the KPD see: Lowenthal, "The Bolshevisation of the Spartacus League," St. Anthony's Papers IX: International Communism; and Spartakism to National Bolshevism, the KPD, 1918‑1924, Solidarity, London, May 1970. Mattick, P‑209 of this thesis. Fischer, Stalin and German Communism, P. 103. Gruber, International Communism in the Era of Lenin, P. 170. Mitchell, Revolution in Bavaria, 1918‑1919, pp. 145‑146. For an analysis of the relationship between these two bodies, see Friedlander, "Conflict of Revolutionary Authority; Provisional Government vs. Berlin Soviet, November‑December, 1918," International Review of Social History, VII, 1962, pp. 163‑176. "Beneath the shifting surface of events the old institutions of the empire survived: the bureaucracy, the army command, the big industrialists, even the Junkers. The Workers' and Soldiers' Councils were superimposed on the old system, but did not destroy it, and after a period of uneasy co‑ existence between the two, the councils were to disappear having accomplished little of their purpose." Ryder, op. cit., P. 159. "On November 12 the Council issued a proclamation stating that all communal land, national, military, and administrative authorities were to continue their regular activities." Lutz, The German Revolution, 1918‑ 1919. P. 90. Badia, Les Spartakistes, P. 77. We should also keep in mind the news accounts of chaos and misery in Russia which appeared throughout 1918 in the German press.
 " Raden," op. cit., p. 8. "The trouble was that in these councils the Social‑Democrats were in a majority. They put forward economistic rather than political, and reformist rather than revolutionary demands. The Social‑Democrats, however, did not impose these views. Their majority reflected the will of the broad mass of the workers inside the councils, and that even during a revolutionary situation." Reichenbach, op. cit., p. 12. Stroebel, op. cit., emphasizes quite rightly that power fell to the proletariat; it was not the result of a hard‑fought battle. Burdick and Lutz, eds., The Political Institutions of the German Revolution, 1918‑1919, p. 216. Indeed, many shared the conceptions described by Lutz: "The goal of the councils movement was the completion of the socialistic revolution and the formation of communistic society. The system itself was two‑sided: political and economic. Politically, it united legislative and administrative power in the councils, discarded periodical elections, restricted the franchise to the proletariat, and placed the political power of the State virtually in the hands of the work­ men of large industries. Starting with the commune the industrial work­ men formed, according to occupation, councils of 1,000 workers, which elected leaders. The delegates of all the communal councils then formed a council for that commune which assumed all the functions of government. City officials, magistrates, and police were displaced by the council and its committees. Communes were organized into districts and districts into provinces, The provinces then were subordinated to the national congress of all councils. This congress was to choose an executive council which was to be elected twice a year and subject to recall. It was to exercise the supreme power of the State. The economic side of the council system aimed to bring about social­ism by the aid of the proletariat and to create an economic organization in which the proletariat would have complete control of the national economic life. Besides the political councils, shop councils were to be organized according to industry. They were, like the political councils, to be formed into districts and provinces Lutz, op. cit., pp. 78‑79. "The German Revolution appeared to be more significant than it really was. The spontaneous enthusiasm of the workers was more for ending the war than for changing existing social relations. Their demands, exercised through workers' and soldiers' councils, did not transcend the possibilities of bourgeois society." Paul Mattick, "Otto Ruehle and the German Labor Movement," n.d., P. 7. Rosenberg, A History of the German Republic, p. 43. Ryder, op. cit., p. 210. It was after this abortive uprising that Rosa Luxemburg and Karl Liebknecht were hunted down and murdered by government troops. Ryder, op. cit., p. 214. This gives an indication of the contradictory nature of mass consciousness at this time. On one day, 700,000 turn out against the SPD in Berlin. Ten days later, over 85% of those eligible to vote throughout Germany do so. Grzesinski, then a trade union bureaucrat, wrote: "The financial authorities refused to appropriate the necessary funds, and shortly after the election of the first parliamentary government, all workers' and soldiers' councils were disbanded." Inside Germany, p. 80. Rosenberg, A History of the German Republic, p. 86. "The political result of the civil war that was waged during the first half of 1919 in Noske's name was the total destruction of the political power of the councils." P. 89. The SPD lost half of its membership in the course of 1919. Ryder, op. cit,, pp. 216‑217. Rosenberg, A History of the German Republic, p. 127. For a good analysis of the content of this law, see Boris Stern, Works Council Movement in Germany, U. S. Department of Labor, 1925, and Guillebaud, The Works Council, Cambridge, 1928. Spartakism to National Bolshevism, p. 16. "The working class was now faced with its greatest opportunity since January 1919, with the ruling class split and a mass movement in action." Ibid., p. 16. "The inflation had devoured all small savings and had reduced the real income of all wage‑ and salary‑earners, of pensioners and rentiers to a level far below the red line of the officially recognized minimum of existence. Wage and salary increases were granted only after terrific struggles. But even such increases as were granted still remained far behind the rapid increase in prices." Anderson, op. cit., p.88. In 1922, there were 4,338 strikes involving 1,600,000 workers. Ibid., p. 88. The ideology and history of these organizations is presented and analyzed in "Raden," op. cit,, as well as in the Informations Correspondence Ouvrier pamphlet. Both are edited translations of the original pamphlet by the Dutch councilist group, written by H. Canne Meijor. For more on these groups, cf. also, Goetz, Les Syndicats Ouvriers Allemands apres la Guerre. Frankel, "The Ruhr and the German Workers," American Labor Monthly, Vol. I, June, 1923, pp. 61‑71. Rosenberg, A History of the German Republic, pp. 208‑210.Also, Anderson, op. cit., pp. 91 ff. Mass unemployment and inflation had led to a radicalization of working class." Spartakism to National Bolshevism, p. 25.